Russia launches its first social campaign aimed at promoting licensed electronic books. Today 90 percent of electronic books are obtained illegally and project’s organizers hope to change it. While the number of bookstores and hardcopy books is shrinking in Russia, the market for electronic books is booming. 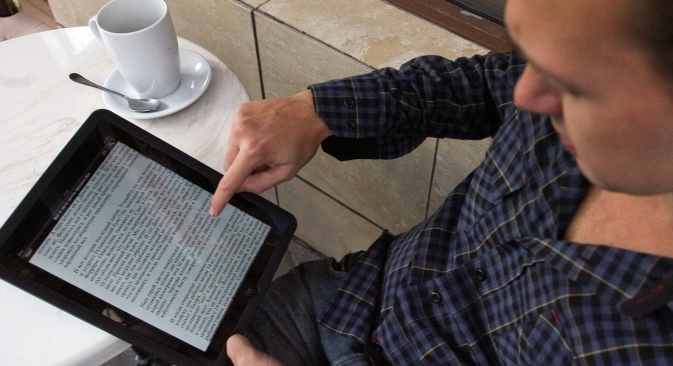 Unfortunately, most e-books in Russia are illegally consumed through pirated downloads. The online project Read Legally aims to alert readers to the harm that illegal downloads do authors and to promote the advantages of licensed e-books. Despite Russia printing a total of about 500 million hardcopy books per year and retaining its spot on the list of top-5 global publishers, the number of bookshops in the country has shrunk twofold in just five years, with paper editions becoming increasingly less lucrative. On the upside, the Russian e-book market has skyrocketed 200 percent in the last few years and may reach 30 million downloads in 2013, according to experts. The problem is that 90 percent of electronic books are obtained illegally, publishers and key book market players revealed at a recent Read Legally project presentation. The new Read Legally online project is designed to increase the popularity of licensed books and change the situation with digital piracy. Vladimir Grigoryev, deputy head of the Russian publishing agency Rospechat, believes that the dialogue with readers should develop on amicable terms, focusing on the quality of licensed products and the royalties paid to writers per copy of their work sold. The project has been supported by various government agencies and key market players, including major Russian publishing houses, online shops, web search engines and payment systems. “This market niche is scalable. Besides, e-books are easier and faster to get, compared to their paper counterparts. For the time being, though, it is pirates who are capitalizing the most on e-book downloads,” said Mikhail Osin, head of digital sales at OZON.ru. “In 2010, OZON.ru became the first company to introduce an e-reader for the Russian market that allowed its users to buy books online and sync their purchases. Unfortunately, the project was a failure,” said Osin. “In practice, Russians usually only use such devices to store their collections of pirated books, and this tendency can be observed even today”. According to OZON.ru data, electronic books are sold in Russia for about 120 rubles (around $4) each, on average, while hard copy books cost around 250 rubles (about $8). Yet, Osin believes that pricing matters are just a pretext obscuring the real reason – a general unwillingness to pay for something that can be obtained for free. “If the whole e-book market went underground tomorrow, our writers would have to find another job,” said Oleg Novikov, CEO of Eksmo – one of the biggest publishing houses in Russia. “Over 70 percent of books published in Russia are by Russian authors. Illegal content exposes writers to financial risks that can make their work unfeasible. Readers need to understand that every time they buy a book from a legitimate source they support their favorite authors. The stock of books that can be accessed legally increases by 60-70 percent annually. All this creates opportunities for readers to download literary works legally”. Readers can access the Read Legally website at www.piratstvu.net to learn about legal e-book stores, the list of which will be updated regularly. Apart from that, the online portal seeks to raise public awareness on a number of relevant issues: for example, the site contains several diagrams which demonstrate convincingly that the lion’s share of work with written texts takes place at the pre-printing stage. Another area the website studies in detail is the distribution of book sales revenues. The project’s organizers also plan to support a dialogue between authors and their readers. In a video posted on the website, a number of Russian novelists elaborate on the harm that illegal books have caused them.